From the gettem' early department... So you fools knew it was coming... and now it's here... 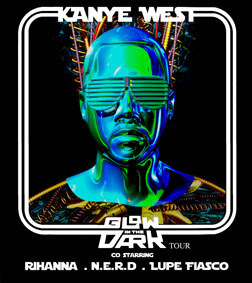 The Glow in the Dark Tour with Kanye West, Rihanna, N.E.R.D. and Lupe Fiasco @ Erwin Center on April 30th! Presale ticket sales start tomorrow, Wednesday, Feb. 27th @ 5:01pm thru Friday, Feb. 29th @ 5:00pm. You can get the presale tix here and using the password GLOW. Public On Sale Saturday, March 1 at 10am. Kanye Omari West (pronounced /ˈkɑːnjeɪ/) (born June 8, 1977 Atlanta, Georgia) is an American record producer and is a multiple Grammy Award-winning rapper who rose to fame in the mid 2000s. He released his debut album The College Dropout in 2004, his second album Late Registration in 2005, and his third album Graduation in 2007. His first three albums have received numerous awards (including nine Grammys), critical acclaim, and commercial success. West also runs his own record label GOOD Music. West's mascot and trademark is a teddy bear, which has appeared on the covers of his three albums as well as the single cover for his song "Stronger". West was born in Atlanta, Georgia, where he lived with both of his parents. When he was three years old (as mentioned in "Hey Mama") his parents divorced, and he and his mother moved to Chicago, Illinois. His father was Ray West, a former Black Panther who was one of the first black photojournalists at the Atlanta Journal-Constitution, and is now a Christian counselor. Kanye's late mother, Dr. Donda West, worked as a Professor of English at Clark Atlanta University, and the Chair of the English Department at Chicago State University before retiring to serve as Kanye's manager. He was later raised in an upper middle class background, attending Polaris High School in suburban Oak Lawn, Illinois after living in Chicago.